Intel’s 28-core CPU has been under scrutiny since it first made an appearance at Intel’s Computex 2018 conference this week. The latest from Chipzilla is that the conference hosts “forgot” to tell the audience – and everyone watching across the world – that the 5GHz multicore behemoth chip was actually overclocked. The 28-core megacore silicon was wheeled out in two massive machines, one from Gigabyte and another from Asus, and both featured what appeared to be seriously heavy duty cooling solutions. These suspicions were later confirmed from behind the scenes shots of the water chiller in question. 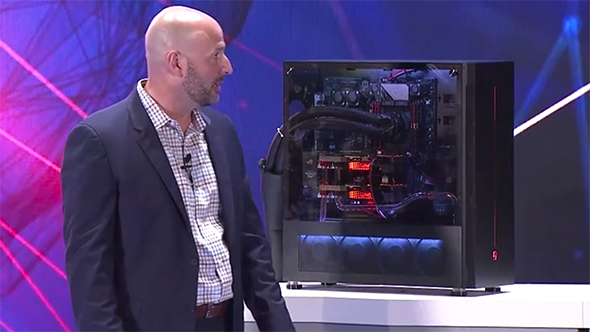 The system used for the demo ran at a stunning 5GHz, and these ridiculously multithreaded machines managed to crush single-socket Cinebench R15 with a score of 7,334 live on stage. Happy with less than 28-cores? No worries, here are the best CPUs for gaming. It’s no surprise that Intel’s demo systems were actually heavily overclocked for the 5GHz clockspeeds they were running at – those giant cooling tubes from the rear of the system on stage were a bit of a giveaway that these systems weren’t your regular household PCs – but Intel shied away from this key detail during the live demonstration. Speaking to Tom’s Hardware, an Intel spokesperson clarified that the script was intended to unveil that the systems were overclocked, and not running at stock speeds as alluded to during the show, but that the hosts simply “forgot” to mention it. 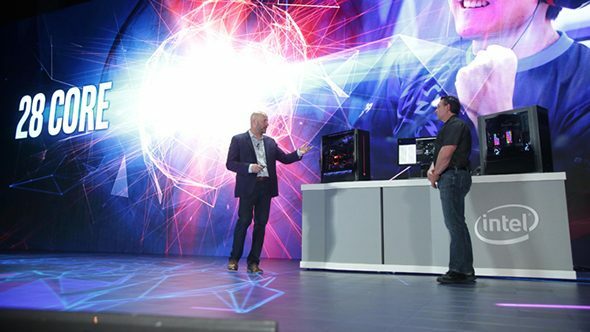 The move from Intel seemed to be somewhat reactionary to AMD’s Computex announcement of a 32-core AMD Threadripper 2 CPU launching in August – which may explain the slapdash demo on stage. Intel ended on a confirmation that the 28-core chip will launch sometime in Q4 2018. However, anyone leaving that conference expecting a 5GHz clockspeed out of the box will be sorely disappointed. In reality, those lofty speeds will only be attainable on some seriously heavy-duty hardware. And while the chip won’t be cheap itself, energy costs to run the system could be dire.